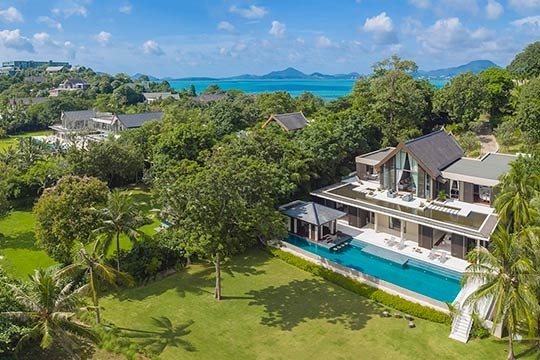 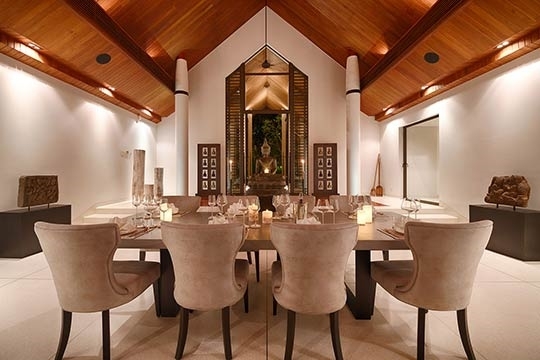 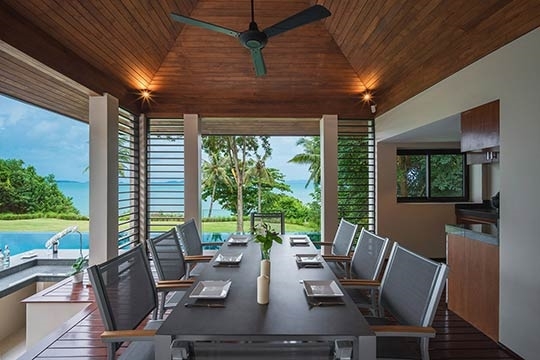 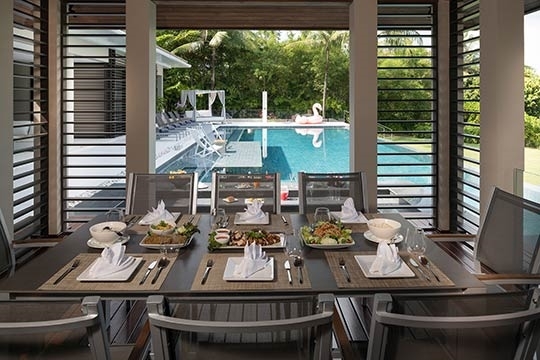 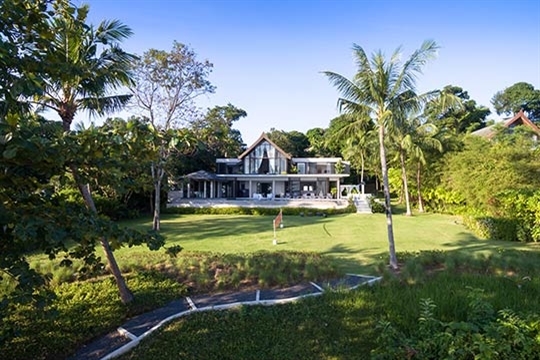 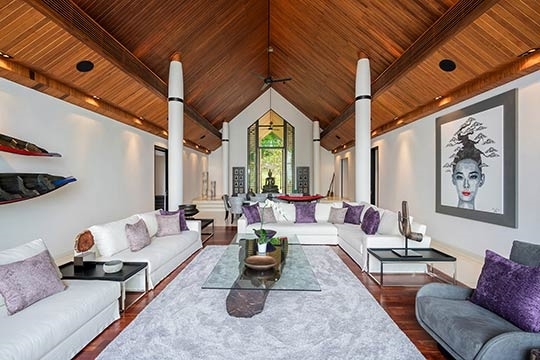 Villa Naam Sawan is a magnificently designed luxury villa resting on the water’s edge in the exclusive Cape Yamu Estate on Phuket’s east coast. 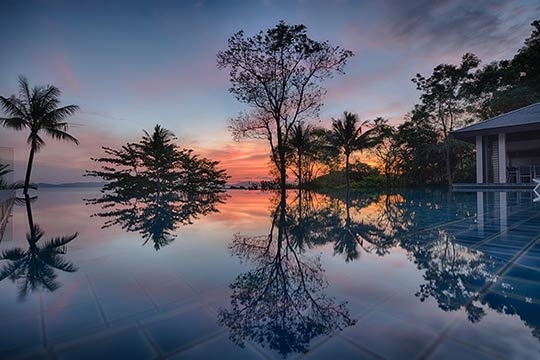 Surrounded by lush hillside and beautifully landscaped tropical gardens, it offers the perfect holiday getaway. 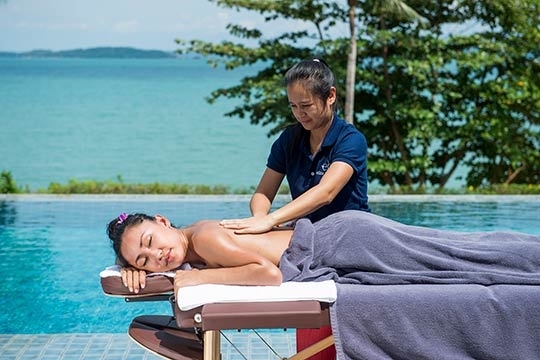 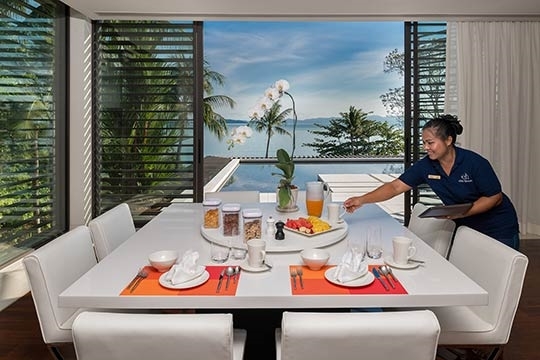 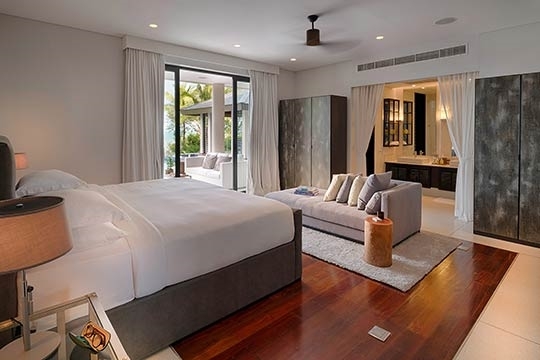 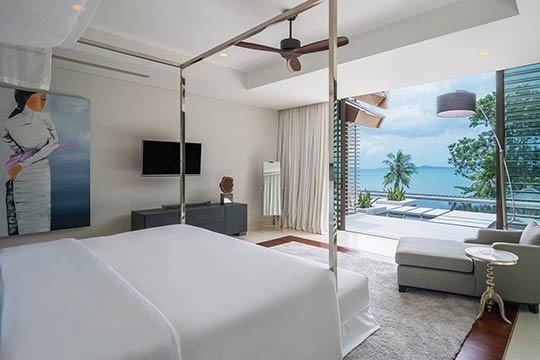 Guest passes are available (extra charges apply) for the five-star sport, wellness and dining facilities at the nearby COMO Point Yamu resort, and one of Phuket’s top-rated restaurants, Breeze, is just a few moments’ walk away. The sheer elegance and size of Naam Sawan becomes apparent on entering the villa’s grand double doors. 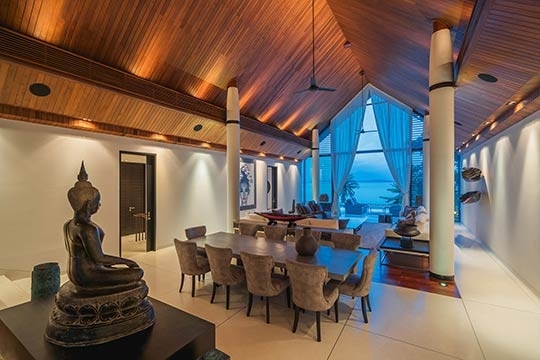 Spectacular views of Phang Nga Bay beckon from the imposing, glass-fronted living and dining pavilion, which is furnished with banks of deep soft cushioned sofas; bold artwork and Asian-inspired artefacts and sculptures accenting the spaces between. 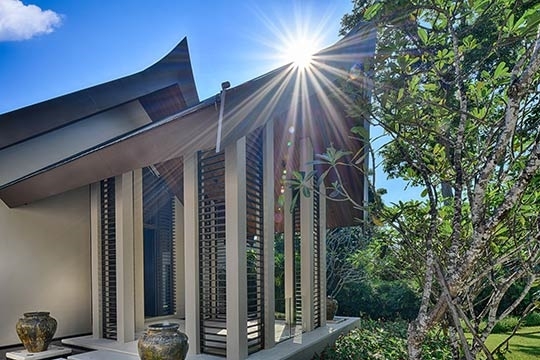 The view is even more hypnotic from the bright terrace that extends from the living pavilion, framed by a rooftop water feature. 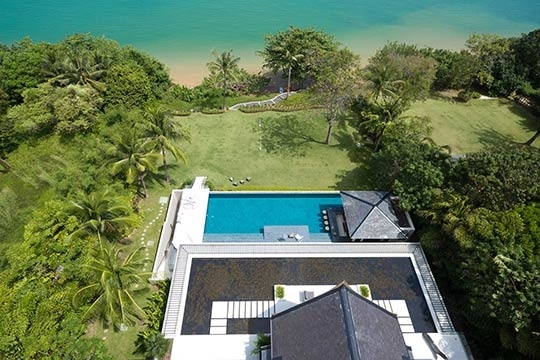 The villa’s stunning 30m pool stretches out below the terrace and, beyond that, vast tropical gardens lead down to the sea’s edge. 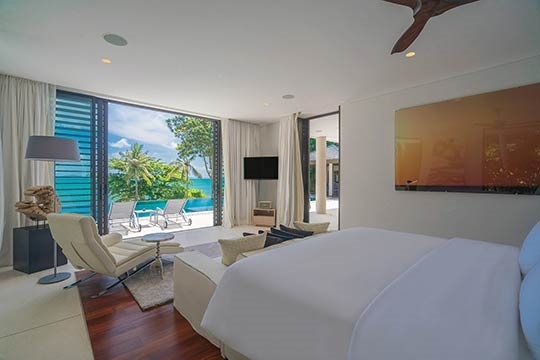 A sea-facing guest bedroom, well-equipped kitchen, and a smart bar/diner area complete the villa’s upper floor. 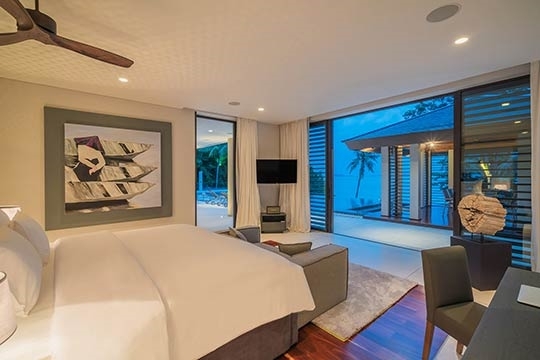 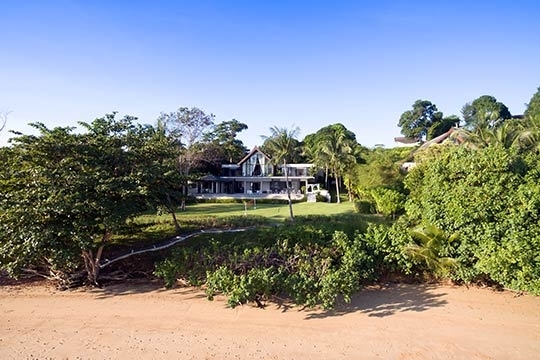 A generous master suite and two further guest bedrooms open onto the pool deck and poolside dining pavilion with swim-up bar on the lower floor, as well as a home cinema room with plenty of comfortable seating and a 65-inch screen and surround sound. 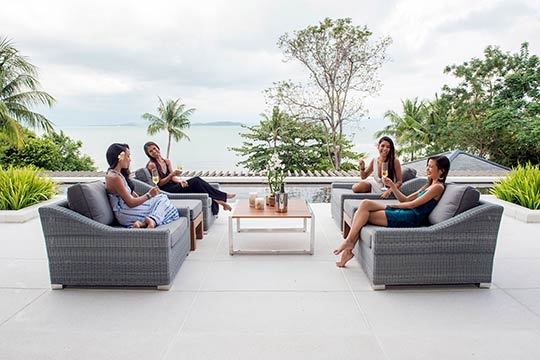 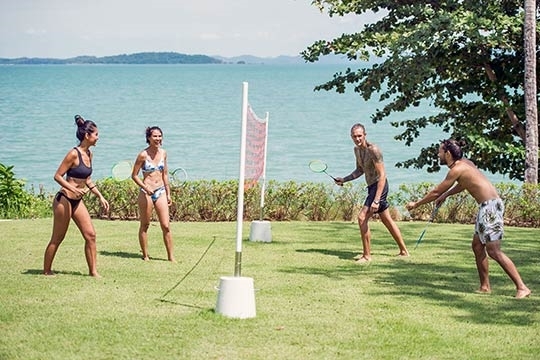 Villa Naam Sawan comes with a professionally trained chef talented in Thai and Western cuisine, a knowledgeable villa manager, villa attendants to take care of guest service and villa housekeeping duties, and 24-hour estate security. 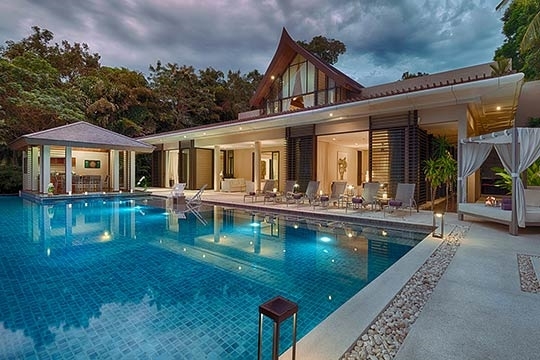 With all the modern facilities and amenities that one would expect from a five-star luxury retreat – and more, Villa Naam Sawan is an ideal choice for an unforgettable Thai holiday experience. 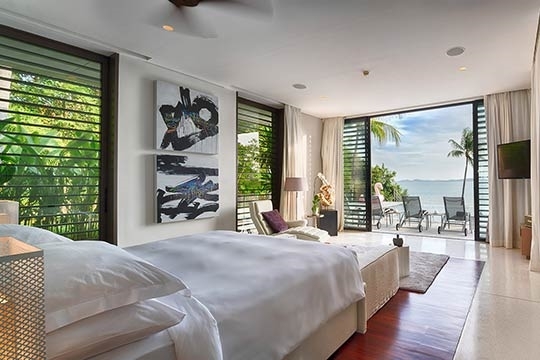 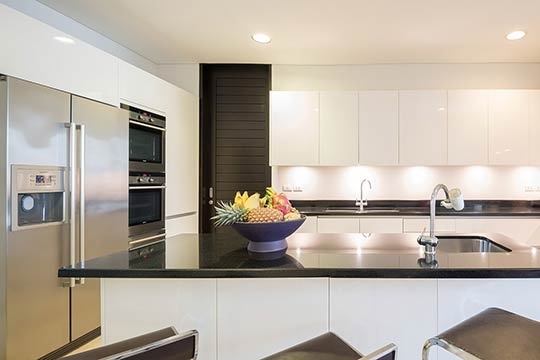 Inspiring interiors with captivating views in a tropical beachfront setting. 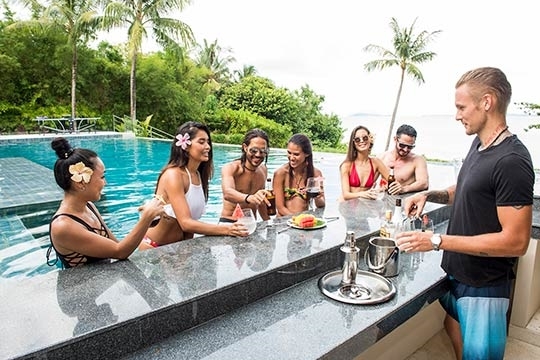 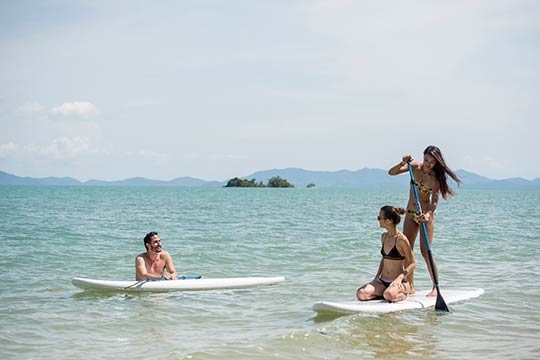 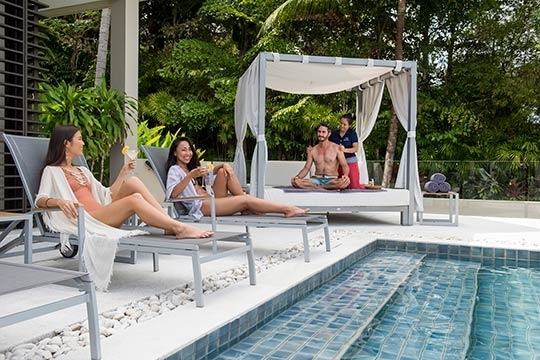 20% off deal with loads of inclusions and much more Description: Stay anytime from now until 30th April and enjoy 20% off rates, a Thai family-style dinner with champagne; massage, pedicure or manicure per adult; and a cooler of 12 beers and sodas or 2 bottles of chilled wine. 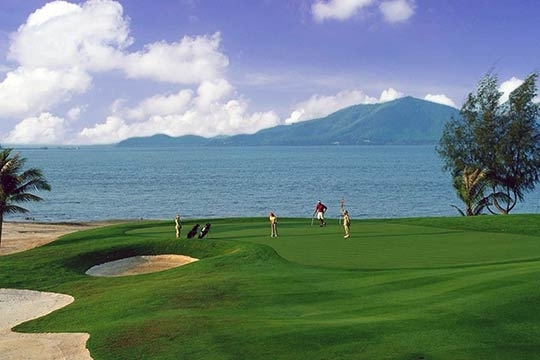 For 5 nights or more, also enjoy a one time 8-hour car rental with driver. 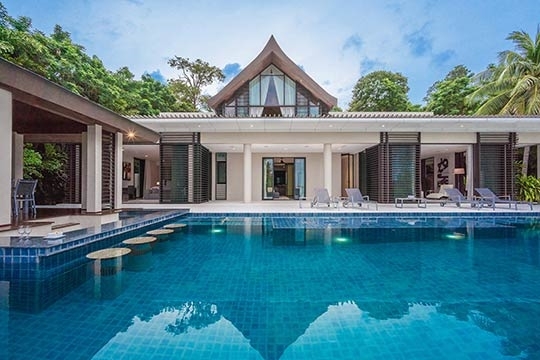 4 bedroom villa located in Cape Yamu, Phuket. 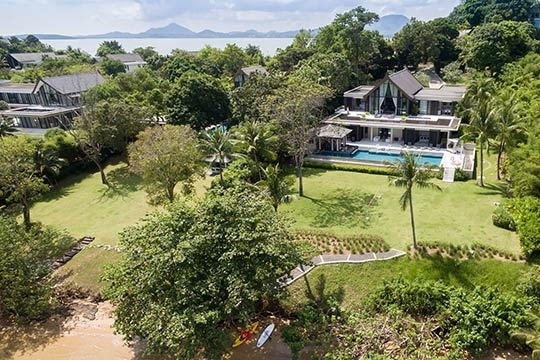 Ideal for Beach in ten, Executive escape, Going for golf, Fair share for groups, Room with a view. 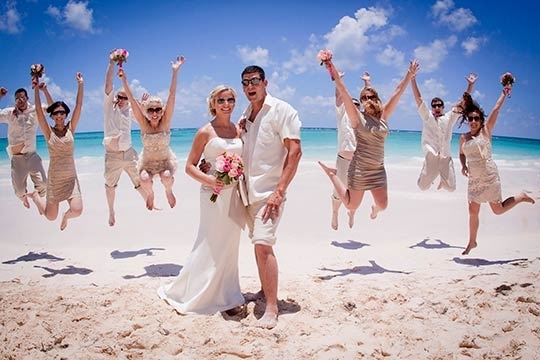 8 out of 10 based on 21 user reviews.